There are few requirements for using system-versioned temporal tables, not many, but still something you need to reconsider when thinking about using Temporal Tables. There are also few additional requirements which can be found from the MSDN article here. If you already have a table and want to add system-versioning into it, the simplest approach is to ALTER TABLE to create a new schema, add two columns and SET SYSTEM_VERSIONING to ON. In the example below I have a table called SomeItems to which I create a schema called ItemHistory and add two columns, SysStartTime and SysEndTime (I prefer descriptive naming, but you can call them what you want) that are sometimes referred to as period columns to support system-versioning. These columns are used for tracking the period where data changes have occurred . Bit later on we’ll look at how these data changes can be queried using the new FOR SYSTEM_TIME clause. 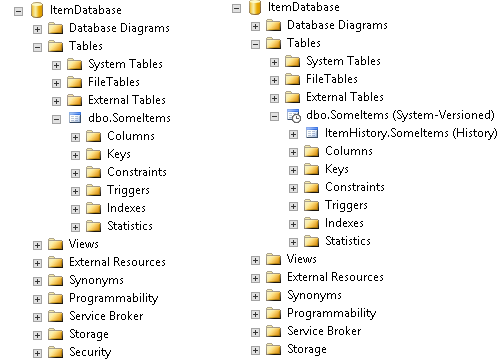 Let’s see what has changed, on left is the original database and on the right side the one with system-versioning turned on. When you create the columns as hidden their contents will not be visible in queries unless you explicitly include them. So any SELECT * FROM query will not show these columns, but a query that has SELECT SysStartTime, SysEndTime FROM will display them. They’re indeed so well hidden that even the IntelliSense had trouble finding them! I find the ability to hide columns a nice addition to the feature. In the example above we simply created a new schema but it is also possible to create an actual table to be used with system-versioning. There are couple reasons why you’d like to do this, for example it’ll give you more options for deciding on the storage, you can create additional indexes on it and you might also like to use data compression on the table. If you’re expecting to generate a lot of historic information it’s definitely nice to have this options available. To create a history table to be used by a table that already has data in it, is rather straightforward. You create the table, add whatever indexes you might need and then proceed with ALTER TABLE commands to enable system-versioning. Comparing to first example where we just created the schema we can see that there aren’t that many differences. There are however few limitations when using tables for system-versioning and they are. Not that many limitations and at least from my perspective nothing that’d make me want to skip using this feature when comparing both pros and cons. Previously we looked at how to add system-versioning to already existing table, but what if you’re in the position of creating a completely new table and you wish to add system-versioning there? The easiest way is to do it with anonymous history table. In this case all you need to do is to create the table with the required datetime2 columns and WITH (SYSTEM_VERSIONING = ON). And that’s it. If we look at the table we see that it’s been created, marked as system-versioned and there’s dbo.MSSQL_TemporalHistoryFor_741577680 (History) named temporal table now available. While this is very easy way to create a Temporal Table, I personally don’t like automatically generated names inside my databases especially when they can avoided with little effort. So with a minor change to query above we can simply define the name we want to use. And that’ll make the outcome so much better! If you want you can of course create a table to hold the history data by following the ALTER TABLE example above. Now that we’ve created a system-versioned table, let’s have a quick look on how they work. I did few updates on the SomeItems table so we have some history. If we query the table we see what the current value is. The next thing we do is to query the table where our change history is kept, it’s called ItemHistory. So we now see the current value on the left and on the right we have all the changes that have happened there since we set the system-versioning on. Not really exciting, so lets see how we can use some of the system-versioning specific queries. This is done by using the FOR SYSTEM_TIME clause that’s new and only usable for temporal tables. First we can look at what the value was in any specific time using AS OF sub-clause. Now we can see what the values were during 7:40 and 7:50 on 2016-09-13. You can also monitor how values have changed over a period of time using BETWEEN sub-clause. Lets have a look at how the value for Blue Items has changed in a week. Admittedly, I should have probably used some code to generate bit more random values over the time instead of these few manual changes, but hopefully you’ll get the point. And with that final example I believe it’s a good time to finish with this introduction post to Temporal Tables. While there’s a bit more to this feature (more than I could fit into one post anyway) this should help you to get started with Temporal Tables. One important topic we didn’t touch yet, but you should be aware of, is the maintenance. Over the time you’ll likely have more historical data than you will need and having it will take up storage, so you do need to create a mechanism for cleaning up. That however is a topic for a new post.